High-Heeled Foot in the Door: TGIF! Cheers to a wonderful week full of friends, fun and fetes! 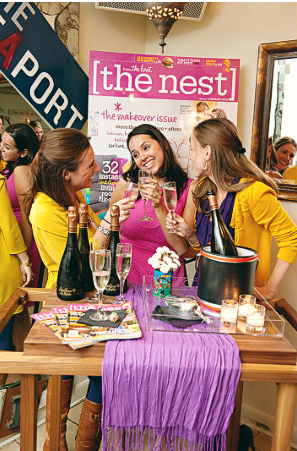 * I just had to share some fun shots from the The Nest event. I love Trent's work and I'm not just saying that because I happen to be in these two shots. :) Excuse the poor picture quality the pictures haven't officially been released yet and I just got a screenshot of them. That looks like so much fun. I'm happily living vicariously through you as I'm heating fish sticks for the kiddos and wearing ill-fitting clothes due to being in the weird in-between stage of pregnancy. Love your dress and your grasscloth ceiling! Camila..it all looks so wonderful. Glad you had fun but sad that I didn't get to meet you for real. Oh I am also glad you don't have to wallpaper the ceiling this weekend! I just want to say that I am your newest follower. I am visiting from TDC. I love your blog. Have a great weekend! It looks like such a fun event! 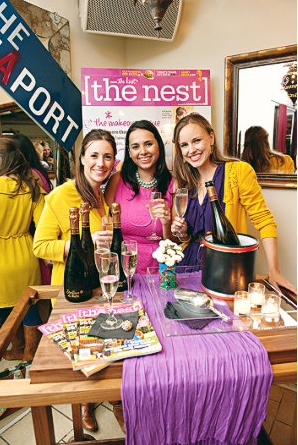 Enjoyed meeting you at the rue party - hope you had a good time! Looks so fun!!! You three are so pretty!! So cute!! I had such a great time and we need to do it again ASAP!